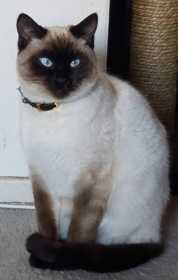 Nimbus is a Siamese with cream color and dark brown face, ears, tail and paws. She is wearing a black leather collar with gold clasps and rhinestones. She was last seen around 9pm on 4/5/19 on Mount Rainier St. and Mt. Whitney.